If you have any questions or want to enquire about dates, use our form to contact Julie Leivers & Damien Pease or see their website for more information. The Horn of Plenty is one of those clever hotels that has survived the test of time by constantly improving itself. This latest addition is six gorgeous new rooms, four of which have terraces or balconies that give 40-mile views over the Tamar Valley. Potter about outside and find six acres of gardens, then a path that leads down through bluebell woods to the river. Inside, beautiful simplicity abounds: stripped floors, gilt mirrors, fine art, fresh flowers everywhere. Bedrooms in the main house come in country-house style, those in the garden have a contemporary feel. All have smart colours, big comfy beds, perhaps a claw-foot bath or a ceiling open to the rafters; ten have a terrace or a balcony. Despite all this, the food remains the big draw, so come to eat well, perhaps beetroot mousse with goat’s cheese parfait, grilled duck with chicory and orange, chocolate cannelloni with banana sorbet; views of the Tamar snaking through the hills are included in the price. Afternoon tea is served on the patio in summer. Tavistock, Dartmoor and the Eden Project are close. Special offer: Enjoy dinner, bed & breakfast from just £90 per person, per night, incl 3 course dinner, choosing from our seasonal menu. Save up to 30%! Valid for stays now - end May 2019. Please quote SPRING19. Dog snacks, 5-acre gardens, loads of great local walks. The Tamar Valley (2 minutes) provides woodland and rivers. Dartmoor (10-minute drive) offers everything a dog dreams of! Lunch from £21. Dinner, 3 courses, £52.50. Tasting menu £70. Afternoon tea from £9.50. Singles £120-£265. 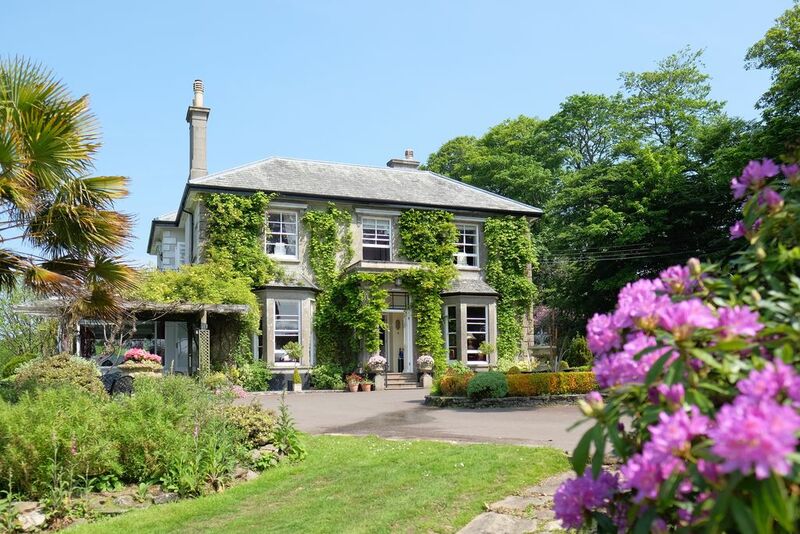 Dinner, B&B £105-£157 per person. Extra bed/sofabed available £25 per person per night. We came for a 50th wedding anniversary meal with our family and all of us thought it was excellent. The food highlights were the gorgeous complimentary mushroom soup and the duck. We found the service friendly, professional and unpretentious. If you'd prefer to sit and relax, we've 5 acres of stunning gardens to wander, log fires in winter and comfy chairs in which to curl up and enjoy a good book. In summer, sip a G&T on our lovely patio and enjoy stunning views and magical sunsets. Fancy a bit of pampering? Call us in advance to book a massage, a facial or a manicure/pedicure with one of our highly trained therapists. 5 minute drive will take you to Tavistock, home of Sir Francis Drake, a beautiful ancient stannary & market town, which was voted “Best market town in Britain” . Their Pannier Market is a must visit, showcasing arts & crafts to local produce. 1 mile away is Tamar Trails Centre. You can canoe on the River Tamar, the river that divides Cornwall & Devon. Or enjoy a spot of Archery, with instructors ready to help any budding Robin Hood. For the thrill seekers we would recommend the tree surfing!